While ensuring the safety of our members and employees is a top priority year round, during the month of May, electric cooperatives across the state and nation join together to recognize National Electrical Safety Month by promoting awareness of the dangers of electricity and how to be safe when using electrically powered devices. Electricity is an essential and dependable resource, but we must all be aware of the serious—and sometimes deadly—consequences of using electricity unsafely, and then we must take steps to prevent the misuse of electricity. Many electrical accidents and tragedies involve common items such as power outlets, appliances, power cords, power equipment and extension cords. The good news is that these accidents can be avoided through a few simple precautions. Unplug it. Appliances, tools and other devices are still connected to electricity when they are plugged in. Turn off AND unplug all portable electric devices when you’re finished using them. Toss it. Inspect electrical cords often for broken connectors or fraying, and throw away any worn cords to eliminate the possibility of shock, short circuit or fire. Cover it. 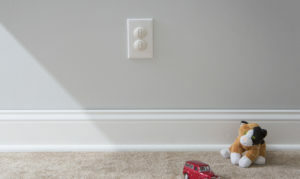 Use plug covers in outlets if you have young children. Teach them never to put their fingers in electrical outlets or appliances, and keep cords and electrical devices away from them. Avoid it. Never go near a power line. If you encounter a downed line, leave the area immediately and notify your cooperative or call 911. Never place ladders, poles or other items near power lines, and don’t drive over downed lines. For more information and ways to stay safe, visit our Electrical Safety page.